Hamilton topped FP3 and in truth, never looked likely to be on anything other than pole once the conditions deteriorated. 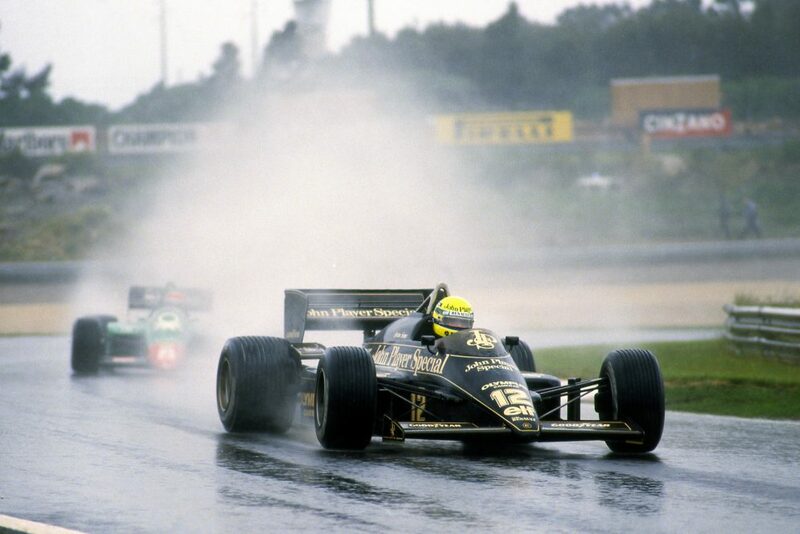 The wet-weather master is just as good in inclement weather when the risk-reward line is so fine, and he managed a perfect flying lap on slicks to bag his 80th career pole. Bottas secured a one-two for the team, leaving them well placed to capitalise tomorrow, especially given they will be starting on the soft tyres. "The session started out ok, but then you look out the garage and you see it's raining, spitting, that it's very humid, I saw a couple of cars spin. It was very difficult to know whether the track was going to be dry or whether it was going to be wet. We obviously had not done any practice in the wet and it looked like it was going to be wet in Q3. We were waiting in the garage for someone else to go out first. I think we made the right decisions as a team today. It's been a bit of an anti-climax because we couldn't do that second lap. 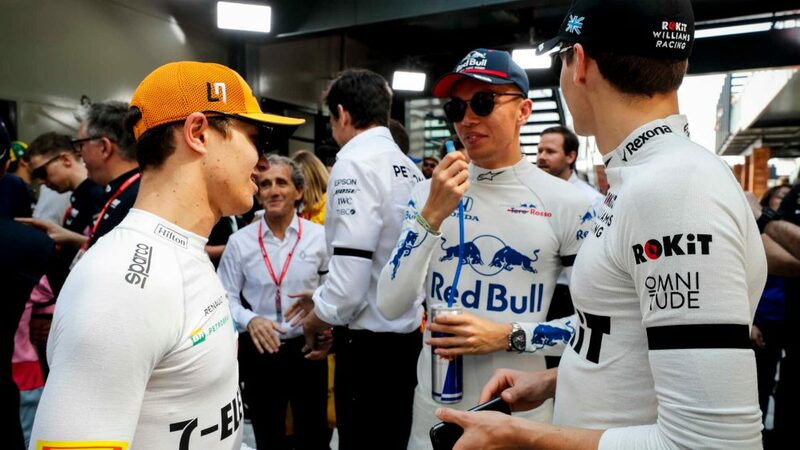 Today, they did such a great job in terms of the timings, there were no mistakes made even though there was a lot of pressure as there always is in Qualifying, yet still everyone was cool, calm and collected and did the job collectively as a team. It's really an amazing journey to be on with this team and I don't think 80 pole positions is the end - but it's a milestone and I'm very proud. The last six years with this team have been incredible and I'm so proud of everyone and so grateful for everyone's hard work which has enabled me to go out and exploit my own abilities." "First of all I want to say congratulations to Lewis - 80 pole positions, that's a big number and he deserves a lot of respect for that. The cars have been so quick today as they have been all weekend and it was enjoyable to drive in qualifying. I struggled a lot in FP3, the car didn't feel stable at all and I was struggling to find confidence. It got better in Qualifying and by Q2 it felt pretty good. Everything came down to one lap in Q3, I missed a little bit in sector 2 and 3, but I enjoyed it. Everyone in our team should be really proud of what we achieved today, of the car that we have and of how the team worked today - every single decision was right, everyone was calm. It might have looked like a hectic session from the outside, but inside the team everything was so calm, we just stuck to our plan and made the right choices which ultimately produced this result." "That was an intense qualifying session and, in the end, Q3 ran pretty smooth for us - and we probably got a little slice of good fortune, too. 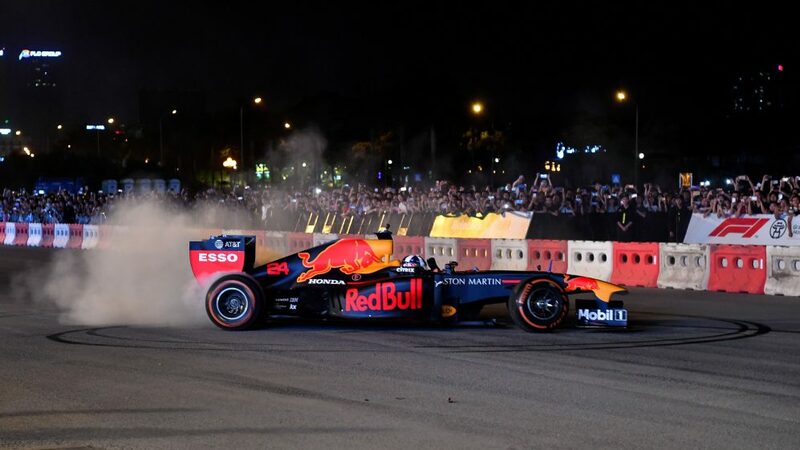 The drivers did the job when they had to, on that first run in Q3, and found the right balance between aggression and caution in tricky, greasy conditions. But today the plaudits go most of all to the team on the pit wall, in the garage and in our race support facilities in Brackley and Brixworth; on days like this, we always say it is much easier to get things wrong than right, and today we made the correct calls in the correct moments. However, the excitement at the result fades very quickly into focus on the race. Conditions are expected to be much warmer and we saw in Sochi that the competitive picture shifted significantly between Saturday and Sunday. So we will stay sceptical, keep our feet on the ground and prepare solidly for all the challenges that we will face tomorrow. The racing happens on Sunday, and that's the bit we need to get right. But today was a good first step in that direction." "We're absolutely delighted with the front row today, the car has been working well all weekend but strong winds and unpredictable rain made it a whole lot more difficult. The first session was fairly straight forward and we were able to get a good lap in with both drivers before the red flag. In the second session we ran as planned on the Soft tyre, having seen the compound work well yesterday. 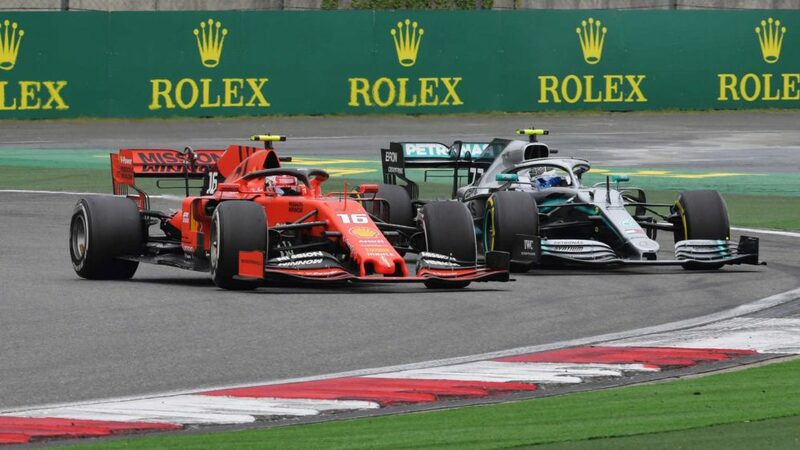 We were a bit surprised to see both Red Bull and Ferrari take the SuperSoft and were discussing whether we should cover it although a shower near the end of the session meant the track would not be quick enough which ended that particular conversation. Qualifying three was always going to be a bit of a gamble as it started with light rain and the radar was showing heavier rain towards the end of the session. We decided to go on the SuperSoft and both drivers did a great job getting good times on the board in tricky conditions. We came into the pits and took a second set with both cars but by then the heavier rain had started to fall and it was clear we were not going to be able to go quicker. We're expecting a hot and sunny day tomorrow which will make life tough on the tyres so it should be an interesting race from that point of view as no one knows quite how they are going to behave." Valtteri Bottas, Mercedes-AMG F1 W09 EQ Power+ at Formula One World Championship, Rd17, Japanese Grand Prix, Qualifying, Suzuka, Japan, Saturday 6 October 2018. “It was a tricky qualifying with mixed conditions. In Q3 we thought that the rain would come earlier, so we decided to go out on intermediate tyres. Unfortunately it did not happen and then we were a bit off with the timing. We came in to fit the supersoft , but in Turn 14 I touched a wet kerb, ran a bit wide and lost some time. Obviously fourth place is not ideal, but at least we were able to put a lap together despite the mistake. Third position could have been easily possible. It’s a pity we did not get it today; the feeling with the car was getting better and better in qualifying. For sure tomorrow is going to be tricky, but we will do our best”. Sebastian Vettel, Ferrari SF71H at Formula One World Championship, Rd17, Japanese Grand Prix, Qualifying, Suzuka, Japan, Saturday 6 October 2018. Screams of frustration were the order of the day for Ricciardo after technical issues left him unable to set a time in Q2. It is safe to say the normally jovial Aussie was as angry as he was frustrated – can he deliver a second fightback drive in a row? 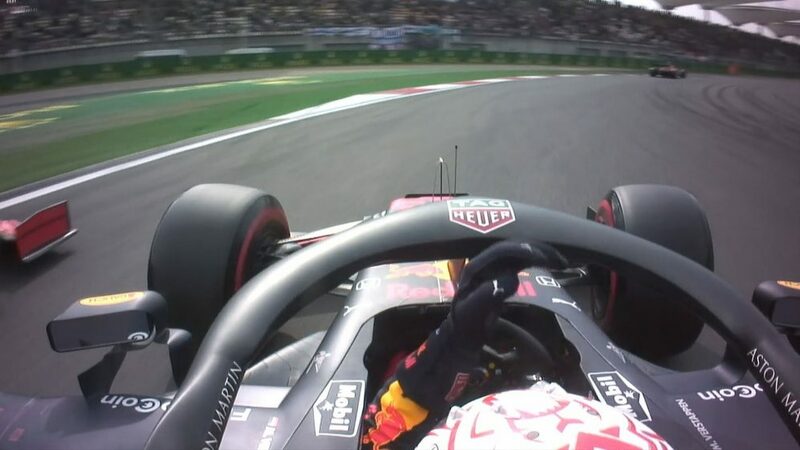 Verstappen had the reliability luck and the fortuitous timing in Q3 to grab third behind the Mercedes duo and will hope to keep the Ferraris at bay come race day. Max Verstappen, Red Bull Racing RB14 at Formula One World Championship, Rd17, Japanese Grand Prix, Qualifying, Suzuka, Japan, Saturday 6 October 2018. Daniel Ricciardo, Red Bull Racing RB14 at Formula One World Championship, Rd17, Japanese Grand Prix, Qualifying, Suzuka, Japan, Saturday 6 October 2018. Ocon was called to the stewards and handed a three place-grid penalty for failing to slow sufficiently under red flags in FP3. Force India did at least get both drivers to Q3 in qualifying later on but the team didn’t fuel their cars for the duration unlike others. 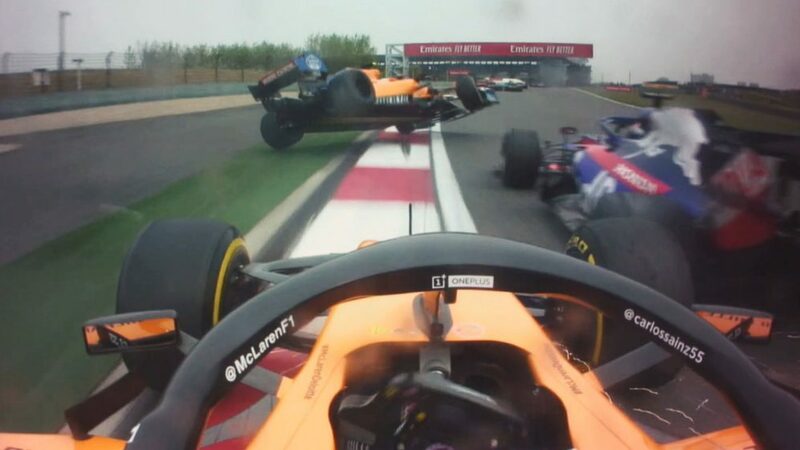 After Perez made a mistake on his first run, the time lost in the pits cost him dearly as the weather deteriorated and he couldn’t get a representative lap in. 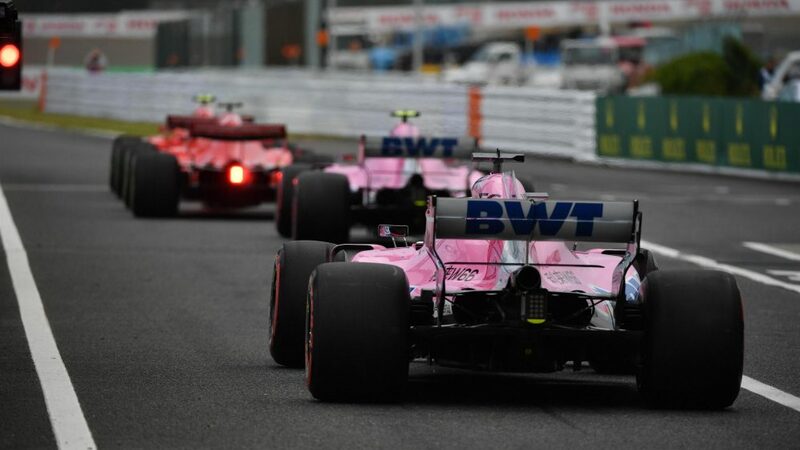 Esteban Ocon, Racing Point Force India F1 Team at Formula One World Championship, Rd17, Japanese Grand Prix, Qualifying, Suzuka, Japan, Saturday 6 October 2018. Sergio Perez, Racing Point Force India VJM11 at Formula One World Championship, Rd17, Japanese Grand Prix, Qualifying, Suzuka, Japan, Saturday 6 October 2018. Hulkenberg fell foul of the damp patches on track, spinning into the barriers at the end of FP3. Renault did well to fix his car ahead of qualifying, but the German was naturally cautious and exited in Q1 for just the second time in 71 races. Sainz at least made Q2 but with rain arriving, couldn’t go any further. Renault have slipped back from their midfield rivals – can they repair the damage in the race and grab some much needed points? "Nico’s crew did a great job to get his car ready for qualifying but Nico was unlucky not to make it into Q2. Carlos did get the cut, but the combination of weather and traffic meant the pace of the car was insufficient to get him into the top 10. [For the race] We have work to do. The forecast says dry and it’s going to be difficult to move up the order as it’s very competitive here." Carlos Sainz, Renault Sport F1 Team R.S. 18 at Formula One World Championship, Rd17, Japanese Grand Prix, Qualifying, Suzuka, Japan, Saturday 6 October 2018. Nico Hulkenberg, Renault Sport F1 Team R.S. 18 crashed in FP3 at Formula One World Championship, Rd17, Japanese Grand Prix, Qualifying, Suzuka, Japan, Saturday 6 October 2018. McLaren have looked off the pace all weekend and qualifying was no different with both cars exiting in Q1 for the second race in a row. Can they pull anything back in the race? 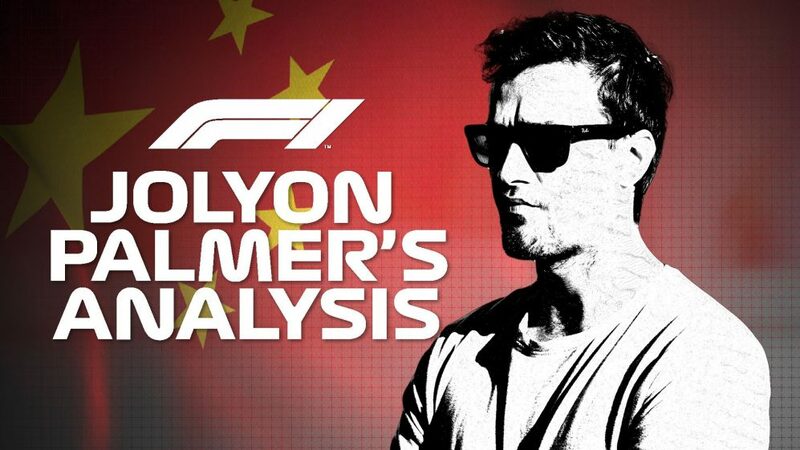 At a track where overtaking is difficult it looks unlikely – but surely Alonso will want to leave this legendary circuit with a bang rather than a whimper? “It has been tough today. We are the last two cars so definitely not the best performance so far. This whole weekend we have been slow in every session, with any tyre, as this high-efficiency circuit seems to hurt us more than others. Aero efficiency is what we are lacking and especially here you need a car with lots of downforce and very low drag for the long straights. “We know in what areas we need to improve, and it has been part of the job we’ve been doing in the last couple of races – trying to make sure next year’s car is stronger than this year’s. “It’s been a tough weekend for us and I think in a way it’s not been a surprise. We’ve been uncompetitive all weekend and our performance is similar to how we were in Russia. “Obviously we’re disappointed with our qualifying positions and our general pace. “Operationally, it has been a smooth weekend and both our drivers extracted everything out of the car. “Looking ahead to tomorrow, although on the face of it there doesn’t seem to be a lot of strategic variants to take advantage of, we will keep our heads down and antennas up, to try and maximise our finishing position. Fernando Alonso, McLaren MCL33 at Formula One World Championship, Rd17, Japanese Grand Prix, Qualifying, Suzuka, Japan, Saturday 6 October 2018. Stoffel Vandoorne, McLaren MCL33 at Formula One World Championship, Rd17, Japanese Grand Prix, Qualifying, Suzuka, Japan, Saturday 6 October 2018. Magnussen struggled with traffic and exited in Q2 but Grosjean made the top 10 shoot out and wound up as the best of the rest in P5. His tenth Q3 in a row, the Frenchman is on a roll and needs to score some big points to keep up the pressure in the constructors’ championship on Renault. Starting on softs, he has a great opportunity to take the fight to the Ferrari ahead. Kevin Magnussen, Haas F1 Team VF-18 at Formula One World Championship, Rd17, Japanese Grand Prix, Qualifying, Suzuka, Japan, Saturday 6 October 2018. Romain Grosjean, Haas F1 Team with French flag at Formula One World Championship, Rd17, Japanese Grand Prix, Practice, Suzuka, Japan, Friday 5 October 2018. Q3 was the aim... and Q3 was achieved. But Toro Rosso exceeded expectations by getting both cars into the top 10 shoot out. 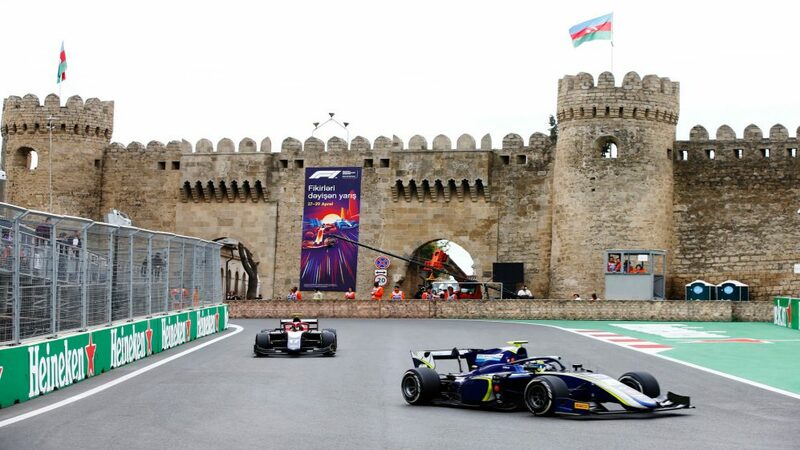 Better was to come, with Hartley managing a career-best 6th, just ahead of his team mate Gasly. The first time in the team’s history that they have such high starting slots in Suzuka, can they deliver a double points finish for the first time this year? Pierre Gasly, Scuderia Toro Rosso STR13 at Formula One World Championship, Rd17, Japanese Grand Prix, Qualifying, Suzuka, Japan, Saturday 6 October 2018. Brendon Hartley, Scuderia Toro Rosso at Formula One World Championship, Rd17, Japanese Grand Prix, Practice, Suzuka, Japan, Friday 5 October 2018. "I think it was a good session. We weren’t the luckiest with the traffic we had on our out-lap, so when I started my lap, the tyres weren’t the best prepared but apart from that I think I should be very happy with the lap I did. It was one hundred percent from my side and the same for how we optimised the car and how we put everything together operationally. We got the car at its best for the last run so, I’m not too happy with the fact that we’re not through, but I’m happy with how it felt and the job that we did." "Although the rain came at the wrong moment in Q2, I am still very happy and really satisfied to get through and into it, as we didn't expect that today. The car felt like it was working beneath me and I knew it was going to be a big step from my first run to my second run. I tidied up my mistakes from that first run in Q1, and then it was a combination of everything. I had a good engineer to set-up the car well, used every bit of the road, committed to every corner, the lap was pretty good, and the car felt alive beneath me. All those key points came together, but we didn't expect to be able to compete with the other teams. I know we have got some quicker cars behind us, Ricciardo for example is going to fly through the field, and I am not going to spend too much time trying to keep him behind. I am going to do my race and hopefully we can pick up some positions at the start and go from there." 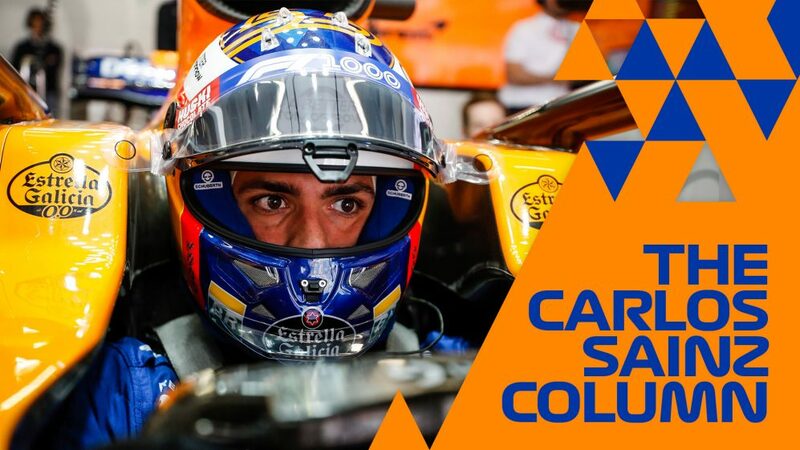 "It was a tricky session because dry-wet mixed conditions in qualifying sessions are the biggest test of team operations in Formula One as we indeed saw today. Some difficult choices had to be made but we’re very pleased to get the best we could from the car today on both sides of the garage. It was very close, and Sergey was unfortunate to narrowly miss out on Q2 but congratulations to Lance on getting out of Q1 with a brilliant lap. We were a little bit down on power by the time we got to his final run, otherwise we could have potentially secured one more place on the grid than we have, but we’re very happy to be starting this race 14th and 17th. Our race pace is good enough to fight from those places, so we’ll look forward to doing our very best tomorrow." Lance Stroll, Williams FW41 at Formula One World Championship, Rd17, Japanese Grand Prix, Qualifying, Suzuka, Japan, Saturday 6 October 2018. Sergey Sirotkin, Williams FW41 at Formula One World Championship, Rd17, Japanese Grand Prix, Qualifying, Suzuka, Japan, Saturday 6 October 2018.